Tulsa County’s dive team is using its training day to help a 15-year-old find his $18,000 prosthetic leg. “It’s not every often we get to search for items like this,” said TCSO Deputy Chad Rose. They’re helping look for 15-year-old Brendon Wiseley’s brand-new prosthetic leg. He lost it while tubing on Keystone Lake Sunday. The leg is made of carbon fiber and titanium, so sank it right away. “I was like, ‘Whoa, did that really just happen?’ Turned around and looked and it was gone,” Wiseley said. Wiseley lost his foot the first time in a lawn mowing accident when he was 7. But it hasn’t slowed him down, he wrestles, plays football and races sprint cars. He also spent a year traveling the country as a Shriner’s Ambassador. “You can’t let anyone put you down saying, ‘oh you’re different,’” he said. He’s been through a number of prosthetics over the past eight years. For the time being, he’s using an old one that doesn’t fit quite right. “It’s too small, it rubs, just doesn’t fit that good,” he said. The new one was state of the art, waterproof and his doctor cleared him to go on the water with it, something he’d never done in the past. “It had a latch where it stayed on real tight and everything. It wasn’t supposed to come off,” Wiseley said. But, he said the water hit just right and with enough force that it pulled his leg into the water. He posted about it on Facebook and News On Six reporter Tess Maune shared it. That post has reached more than 560,000 people. “It was crazy…I’m glad lots of people shared it and liked it. It’s really cool,” Wiseley said. The post also caught the eye of the Tulsa County dive team. The divers said because the area where Wiseley lost his prosthetic is a little shallower, they thought it might be easier to actually dive than use the sonar. Wiseley knew exactly where he lost his leg and took the divers straight to it. They didn’t have any luck Tuesday, but that’s not going to hold Wiseley back. “No, you just gotta keep pushing yourself. You can’t feel bad about anything, just keep up,” he said. The divers said the conditions in the cove are perfect for finding the prosthetic, they just ran out of time Tuesday. 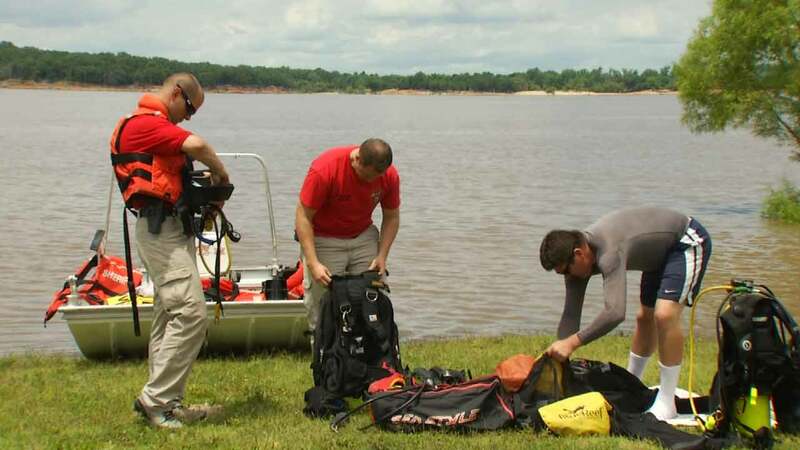 OHP’s dive team has offered to use their training day to search for the leg this week, too. Wiseley said he won’t take his leg on the lake anymore, even though it’s supposed to stay on.